Litigation is under siege from many directions, but as I argued in the introduction, some attacks turn out to be more significant than others. While tort reformers, for example, are aimed simply at reducing the volume and cost of litigation, other antilitigation efforts can eradicate whole species of lawsuits. It is these more sweeping campaigns, in which policy makers are led to ponder the merits of litigation versus other problem-solving devices, that teach the most about the roots of America's distinctively litigious public policy style. In focusing on two of the most visible components of the attack on litigation, tort reform and alternative dispute resolution, commentators have missed broader, more theoretically significant patterns. A review of the many struggles over litigious policies in American politics and the political forces involved in the litigation debate puts the individual battles in context. It would be arbitrary to pinpoint a moment when the attack on litigation began. There have always been antilitigation impulses and even antilitigation reforms in the United States. Yet as late as the 1960s, in the midst of an enormous expansion in litigious policies, there was little mention of litigiousness as a major problem in American life. Indeed, within the legal profession the major criticism of the legal system was that it was inaccessible and so unavailable to poor and middle-class people. More litigation, not less, was needed. At some point in the 1970s, however, a shift began. Concerns about accessibility faded, and misgivings about litigation took center stage. A wide-ranging debate over the costs and benefits of litigation began. Within the bar an indicator of the shift was the 1976 Roscoe Pound Conference on the Causes of Popular Dissatisfaction with the Administration of Justice. Number one among the causes cited by the participants—federal judges, elite lawyers, and law professors—was "overload," both in the sheer number of cases filed and in the expectations people had about the problem-solving capacities of courts. "The American public today perceives courts as jacks-of-all-trades, available to furnish the answer to whatever may trouble us," said Simon Rifkind, a corporate lawyer and former federal judge. As a result, courts were carrying a "backbreaking burden." Others complained of the expanding length and complexity of litigation. With the growth of procedural rights for defendants, criminal cases "never seem to end," said Walter Schaefer, a judge. Francis Kirkham, a corporate lawyer, claimed that in some kinds of civil litigation "discovery knows no bounds" and that class action lawsuits in the federal courts were "reaching flood stage." Echoing the aquatic metaphor, U.S. Attorney General Edward Levi said that courts were "deluged with business." The problem of overload was so serious, claimed Solicitor General Robert Bork, that "the integrity of the federal system is threatened." Kirkham worried whether the nation was "retaining the capacity to achieve justice by rational means." The Pound Conference participants suggested a myriad of solutions to the problem of overloaded courts, proposals that would set much of the agenda for antilitigation reformers over the next two decades. Contrary to their image as lawsuit mongers, the elite lawyers at the conference took a very critical stance toward litigation. 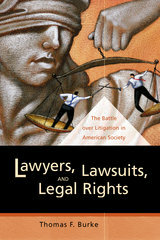 Beginning in the 1970s, a new skepticism about the utility of litigation also arose among academics. Researchers in law and the social sciences argued that courts lacked the capacity to be good policy makers and that litigation wasn't a very effective way to make society more just. Although these themes were hardly new novel, they took on particular poignancy coming after two decades in which reformers had turned repeatedly to litigation as a tool of reform. Indeed, some of the criticisms of litigation came from those who had eagerly accepted the premises of the legal reform model. Gerald Rosenberg went to law school hoping to become a social reformer but discovered that social change through constitutional litigation was a Hollow Hope. Radical lawyers in the critical legal studies movement, some of them veterans of civil rights struggles, analyzed the limits of liberal legal reform; critical race theorists, though more sympathetic to rights laws, joined in. Meanwhile communitarian critics of liberalism articulated yet another set of complaints about the influence of litigation on American life. Mary Ann Glendon, for example, argued that American politics was overly legalistic, dominated by "rights talk" that polarized citizens and oversimplified issues. Economists condemned litigation for its high costs and impact on American competitiveness. Conservatives and a few liberals criticized the Warren Court's expansion of procedural rights in the criminal justice system. Even many tort law professors, a group that had promoted the liberalization of liability in the 1950s and 1960s, were by the 1980s deeply troubled by the shortcomings of litigation as a means of compensating injury. Echoing their criticisms was a flurry of research on civil litigation that began in the 1980s, much of it supportive of antilitigation reforms. By the 1990s antilitigation reform even became the stuff of national politics, thanks largely to the efforts of Vice President Dan Quayle. During the Bush administration Quayle developed litigation reform into a political issue, and mainly through his rhetorical attacks it occasionally popped into the national spotlight. The apex of Quayle's anti-litigation campaign was his 1991 speech to the American Bar Association (ABA). Applauding Walter Olson's The Litigation Explosion and estimating that tort litigation cost over $300 billion dollars each year, Quayle called the civil justice system a "self-inflicted competitive disadvantage." In one of the more widely discussed sections of his speech, Quayle asked, "Does America really need 70 percent of the world's lawyers? Is it healthy for our economy to have 18 million new lawsuits coursing through the system annually?" As a step toward remedying these conditions, Quayle proposed fifty antilitigation reforms recommended by the President's Council on Competitiveness, which he chaired. Rising to the challenge, John Curtin, president of the ABA, said his organization was willing to consider the proposals, but "Anyone who believes a better day dawns when lawyers are eliminated has the burden of explaining who will take their place. Who will protect the poor, the injured, the victims of negligence, the victims of racial discrimination, and the victims of racial violence? . . . Lawyers are the simple yet essential means by which people seek to vindicate their rights and we must not foreclose that means." Quayle had not actually proposed the extermination of lawyers, so Curtin's response was a bit of a non sequitur. But the exchange was dramatic and drew media attention. Sophisticated critics, besides noting Quayle's use of dubious statistics, pointed out that Quayle, like Curtin, was shadowboxing: his reforms were far less sweeping than his rhetoric suggested. Many were minor procedural measures that the ABA itself had supported; others sounded major but on inspection turned out to be narrow in scope. Nonetheless, a splash was made. None of Quayle's suggestions found its way into federal legislation, though President Bush did sign an executive order implementing some of the procedural ideas. But in legal reform Quayle and Bush found an agreeable, albeit minor, political issue, one that has since become a staple of Republican politics. In the presidential election of 1992 President Bush's first television ad mentioned "legal reform," and his campaign criticized Bill Clinton and the Democratic Party for accepting massive contributions from plaintiff lawyers. Republicans even picketed Bill Clinton with signs reading "Stop the Trial Lawyers' Takeover of the White House." Newt Gingrich made "Common Sense Legal Reform" the ninth plank in his Contract With America and pushed various tort reform bills through the House. In one of the highlights of his otherwise uninspired 1996 presidential campaign, Robert Dole joked after falling from a stage during a campaign event that trial lawyers had begun calling him on his cell phone even before he hit the ground. And George W. Bush, proud to be an enemy of plaintiff lawyers, pointed to tort reform, while campaigning for the presidency in 2000, as one of his major accomplishments as governor of Texas. Dole and both Bushes have mentioned litigation reform in their televised debates, and the Republican platform since 1992 has contained antilitigation language. Although their antilitigation rhetoric sweeps broadly, these politicians are in fact mainly focused on one species of lawsuit, the personal injury claim. They tend to ignore other, more common forms of litigation—over contracts, property disputes, and family issues. Business-to-business contract disputing, for example, is at least as important a source of lawsuits as tort, but in the litigation debate this is obscured. In 2000, tort lawsuits constituted 00 percent of the case load of a sample of state courts; contract cases amounted to 00 percent. Yet when politicians, pundits, and journalists criticize "litigiousness," they are speaking almost invariably about personal injury lawsuits. Why does tort litigation receive such a disproportionate share of attention? The simplest explanation is that those on the receiving end of tort lawsuits—business groups, governments, and professional organizations—have the means and the incentive to publicize their discontents. These powerful interests have set the agenda both for politicians and the media. Other forms of litigation—for example, contractual disputes—have business interests on both the giving and receiving ends, creating a much more ambivalent attitude. Moreover, many common types of litigation—family disputes, for example—don't involve business interests at all. It is only those forms of litigation in which powerful interests appear solely as defendants—tort, civil rights, and environmental lawsuits—that are most visibly attacked. Even in this grouping, however, tort litigation seems to get the lion's share of the attention. Aside from the interests behind it, there seems to be a special resonance to complaints about personal injury law. David Engel has argued that tort litigation stories serve as symbols of community disintegration in a way that anecdotes about, for example, contract disputes cannot. Engel studied attitudes toward tort law in a rural county in the Midwest. In the view of Engel's subjects, plaintiffs in tort lawsuits deserved special scorn because they had used the coercive powers of the state to get money they did not earn from defendants who never agreed to assume responsibility for their injuries. Thus for Engel's subjects, as for many Americans, stories about tort litigation symbolize the decline of personal responsibility in society. Moreover, tort stories are dramatic and easily understood, making them easily digestible fodder not just for everyday gossip but also for the news and entertainment media. The story of Stella Liebeck, who had the infamous encounter with McDonald's coffee, radiated through public discourse because it dramatically illustrated what "everyone knows"—that Americans routinely sue others for accidents they themselves are responsible for, that big corporations are excessively punished because they are "big pockets," and that tort plaintiffs are overcompensated by runaway juries. Indeed, aspects of the Stella Liebeck story that were inconvenient to this portrayal—such as the fact that Liebeck eventually settled for roughly one-fifth of the widely publicized $2.9 million jury verdict, that her burns were horrifyingly severe, or that McDonald's coffee had previously scalded hundreds—were widely ignored. The notoriety of tort litigation, combined with the powers of persuasion of corporate and professional interests, has put personal injury lawsuit reform at the top of the antilitigation agenda. Yet the range of antilitigation politics sweeps much more broadly than tort suits. Business-to-business disputing, though not the subject of television sitcoms or Republican platform planks, has been the target of several antilitigation efforts, especially alternative dispute resolution, discussed below. Indeed, some of the more obscure antilitigation reforms, though not the stuff of advertising campaigns or presidential speeches, are among the more significant. There are a vast array of antilitigation efforts spanning varied policy areas and levels of government, but they can be usefully divided into four basic forms: (1) discouragement, attempts to discourage plaintiffs and so reduce litigation; (2) management, attempts to make the disputing process more efficient and harmonious; (3) replacement, attempts to replace litigation with some other problem-solving device; and (4) resistance, opposition to new forms of litigation (see Table 1.1). Each form creates a distinctive politics. Of the four types, discouragement and management efforts have been the most visible, garnering the most media attention—and the most hyperbolic rhetoric. Yet as I argued in the introduction, replacement efforts and the battles they create expose more fully the roots of America's distinctively court-centered public policy style because they represent more fundamental attacks on litigation as a problem-solving device. Discouragement reforms take the most familiar and straightforward route to limiting litigation: they aim to discourage plaintiffs from bringing lawsuits. They do this by making lawsuits either harder to bring, harder to win, or less rewarding for the plaintiff. The politics of discouragement is similarly straightforward. Groups aligned with plaintiffs fight groups aligned with the defendants. Discouragement battles are thus highly partisan, with most Republicans on the antilitigation side and most Democrats lined up with the plaintiffs. These are struggles over distributional justice—who gets what—with dollars and the resources of the judiciary at stake. Proponents do not typically question the utility of litigation itself but argue that plaintiffs with weak claims are abusing the legal system. The most prominent of all discouragement efforts, indeed of all antilitigation efforts, is the tort reform movement. A "tort" is an injury. Plaintiffs in tort cases seek monetary compensation for their injuries, punishment for their injurers, and some reassurance that injury-producing conduct will be deterred. The tort reform movement argues that the liability system is out of control, swollen with ridiculous claims, and that the jury system has in effect produced a lottery. Tort reformers promote an array of reforms aimed at making tort litigation less enticing for plaintiffs: barriers to filing a claim, an expansion of defenses, and limits on the amounts and types of awards. With a broad base of support among business and professional groups, the tort reform movement has been churning tort law now for more than two decades. The tort reform movement is a huge political enterprise. Nearly every large company, trade association, and professional group is involved at some level. Since the drive for tort reform began in the 1970s, these groups have become more and more organized, creating coalition organizations to coordinate their activities. The American Tort Reform Association (ATRA) helps coordinate and publicize state tort reform efforts. ATRA's membership includes Fortune 100 corporations, professional groups, insurers, small companies, nonprofit organizations, and a few units of government. ATRA serves as a clearinghouse for a network of forty state groups, providing them briefing materials, model bills, polling research, witnesses, and speakers and publishing several periodicals that cover their efforts. ATRA's publicity efforts are considerable, with press briefings, television and radio commercials (featuring Jack Kemp and George McGovern), a documentary (hosted by Walter Cronkite), an in-flight video, a website featuring "loony lawsuits," posters, pamphlets, and bumper stickers. For a time the largest coalition in the national tort movement was the Product Liability Coordinating Committee (PLCC), which at one point had an estimated budget of $3 million and a membership of 700,000 businesses and trade associations, including the Business Roundtable, the Chamber of Commerce, the National Association of Manufacturers, and an estimated 60 percent of the Fortune 500 companies. Since the defeat of sweeping product liability legislation in the late 1990s, the PLCC has become inactive, but there are several other national coordinating bodies. The Civil Justice Reform Group is a separate group of general counsel from sixty of the nation's one hundred biggest companies who channel funds to various antilitigation organizations. The Health Care Liability Alliance campaigns for medical malpractice reform laws: the Coalition to Eliminate Abusive Securities Suits successfully lobbied in the 1990s to limit shareholder litigation against companies. These groups are just the tip of the iceberg. Most tort reform activities are carried out by individual businesses, trade associations, and state tort reform organizations. The American Medical Association, for example, has crusaded for a variety of tort reforms over the past two decades. The U.S. Chamber of Commerce has made tort reform, especially legislation to restrict class action lawsuits, a priority. In 1998 the chamber created the Institute for Legal Reform, which has sponsored conferences and published reports on such matters as legal fees, product liability law, and judicial elections. Among the businesses, one of the most active is Aetna, an insurance firm whose interest in civil justice litigation is considerable: it defends thousands of lawsuits each year. Aetna is a member of national tort reform organizations, but it has also conducted its own antilitigation lobbying and advertising campaigns. In addition, Aetna has funded academic symposia, conferences, and research on tort law at the Rand Institute of Civil Justice, the Brookings Institution, the Manhattan Institute, and the American Law Institute. Although Aetna is unusually active, its antilitigation activities are hardly unique. Many companies and trade and professional associations fund antilitigation lobbying, advertising, and research. On the research side, they have helped fund a plethora of antilitigation research (see note 16). Add this to the efforts of the coalition organizations, and the tort reform movement seems quite formidable. Yet tort reformers have been largely frustrated in their efforts in Congress. Their successes have largely come through state legislatures, and even there, they have often been thwarted by judicial rulings overturning tort reform laws on state constitutional grounds. The tort reform movement may have had its greatest impact outside the legislative arena, where it has apparently persuaded judges and juries to be more skeptical about personal injury claims. Indeed, tort reformers have helped to reshape public discourse about litigation, undermining the heroic view of lawyers and lawsuits that has always competed in the American mind with more unsavory images of the legal profession. Thus tort reformers have made steady gains in the cultural war over litigation even as they have often lost particular political and legal battles. Federal tort reform efforts began with a Nixon administration report on medical malpractice litigation in 1973. In the following years, the Ford, Carter, and Reagan administrations sponsored reports proposing antilitigation legislation. Federal product liability legislation, first introduced in the mid-1970s, has over the years varied in content. The earliest bills sought to undo the strict liability standard that the California Supreme Court had first adopted; others have provided for caps on damages and expanded defenses. None of the bills has become law, despite strong support from Republicans and some Democrats. Until 1994 the Democrats' control of Congress and use of filibusters prevented any bill from advancing. After the "Republican Revolution" of 1994 the combination of Democratic opposition, the threat of filibuster, some defections by Republicans, and Clinton administration opposition kept product liability bills from being enacted. The closest any of the bills came to passage was in 1996, when Congress failed to override a Clinton veto. The George W. Bush administration's enthusiasm for tort reform has been diminished by the Democrats' control of the Senate and perhaps by the political fallout from the Enron scandal. Federal medical malpractice tort reforms have also failed to make any headway, despite much discussion. Between 1990 and 1994 forty-six medical malpractice reform bills were introduced into Congress, most of them involving discouragement reforms. There was some talk about putting a cap on malpractice damages in the Clinton health care bill, but ultimately the bill had only minor medical malpractice provisions. Indeed at the national level, the tort reform movement has been able to enact only relatively minor laws. These laws, passed during the Clinton administration, limited the liability of small airplane manufacturers, restricted company shareholder lawsuits, immunized volunteers (but not the organizations they volunteer for) from litigation, taxed tort awards for emotional distress and punitive damages, protected those who donate food to shelters from liability, capped tort liability for Amtrak at $200 million per accident, restricted medical malpractice claims against cruise ship operators, protected producers of raw materials for medical products from some suits, and limited liability claims arising from the "Y2K" computer scourge. While the number of laws passed might seem impressive, these measures were limited in scope and effect, relatively small-scale victories scattered amongst a series of major defeats. Observers suggest several explanations for the failures of the federal tort reform effort: conflicts among the business groups advocating the reforms, concerns about federalism, and most important of all, the powerful opposition of plaintiff lawyer groups. Whatever the reason, the major legislative successes of the tort reform movement thus far have come at the state level. The first major wave of state tort reform was in the mid-1970s, when medical malpractice insurers rapidly raised their rates and exited some markets. The result was labeled a "medical crisis" in many states, with doctors finding it difficult to get malpractice insurance. Some California doctors even went on a brief strike to dramatize their plight. Legislatures responded with a flurry of tort reforms. Between 1975 and 1978, fourteen states passed laws encouraging arbitration, twenty-nine created screening panels for lawsuits, twenty limited attorney contingency fees, fourteen put monetary caps on damages, and nineteen restricted the collateral source rule. The second wave of tort reform, which commenced in the mid-1980s, was much broader, going beyond medical malpractice to all areas of personal liability. Here again a major stimulus was a rapid rise in liability insurance rates together with reports that day care centers, playgrounds, and other facilities were closing because of the lack of affordable insurance. Between 1985 and 1988 sixteen states capped "pain and suffering" damages, twenty-eight limited punitive damages, twenty restricted the collateral source rule, and thirty modified their joint and several liability rules. In 1986 alone, forty-one of the forty-six legislatures who met passed some type of tort reform. After several years of relative calm, a third wave of tort commenced, possibly spurred by state-level Republican gains in the 1994 elections. In 1995 eighteen states passed tort reforms, including extensive reform packages in Oklahoma, Illinois, Indiana, and Texas. Between 1995 and 1997 fourteen states limited punitive damages, thirteen modified their joint and several liability rules, and eight made significant changes in product liability law. Research suggests that some of the measures passed in the first two waves of tort reform, particularly the caps on damages, have modestly reduced lawsuits, damage awards, and liability insurance premiums. Many of the tort reforms, though, seem to have had little or no effect. But even where the tort reform movement has fallen short in the legislatures, it may be having indirect effects on the judicial process. The data are far from conclusive, but there are indications that publicity about the "litigation explosion" may be changing the behavior and attitudes of judges and juries. Research has found that jurors firmly believe that there has been a "litigation explosion" and are deeply suspicious of plaintiffs in tort lawsuits. Another study found a "quiet revolution" in products liability, with judges rolling back some of the litigious policies enacted in the 1960s, seventies and early eighties, possibly in reaction to the publicity generated by tort reformers. As a result of the shift in doctrine, plaintiffs are faring worse, and claims have been dropping. Thus the gains of the tort reform movement may go well beyond the passage of legislation. The chief antilitigation effort in criminal law recently has been the move to restrict habeas corpus lawsuits, which critics say give prisoners and death row inmates too many chances to appeal, resulting in long delays. In 1996, in the wake of the bombing of the Murrah Federal Building in Oklahoma City, President Clinton signed the Anti-Terrorism and Effective Death Penalty Act, which included a provision limiting death row inmates to "one bite of the apple," a single habeas corpus appeal. The Supreme Court upheld this statute against a constitutional challenge—a ruling in line with several previous Court decisions limiting the right to appeal. A second law, also passed in 1996, the Prison Litigation Reform Act, seeks to discourage civil suits by prisoners and to reduce judicial control over the administration of correctional institutions. It requires prisoners to pay a fee when filing a civil suit and penalizes prisoners who file lawsuits deemed frivolous with the loss of "good time" credits toward early release from prison. Thus Congress has attempted to discourage prisoner lawsuits, one the largest and fastest-growing categories of federal litigation. When the U.S. Supreme Court in 1989 released a string of rulings that had the net effect of discouraging plaintiffs in civil rights cases, Congress reacted with an encouragement law. The 1991 Civil Rights Act undid the Court's decisions but went beyond this to expand the use of jury trials and increase the kinds of damages available to plaintiffs in discrimination lawsuits. These changes have in turn generated a host of horror stories about discrimination litigation, and in Congress discouragement bills have been introduced to limit damages and institute a "loser pays" system in civil rights lawsuits. Many American environmental statutes allow citizens to either sue regulators for being too lax in their enforcement efforts or to bypass the regulators entirely and sue alleged polluters directly. The citizen lawsuit provisions have been criticized for misdirecting enforcement and for creating an undeserved windfall for environmental groups who win damages lawsuits. Discouragement reforms that limit clean air and clean water lawsuits have, however, failed to attract much support. George W. Bush's proposal to limit the sweep of citizen lawsuits under the Endangered Species Act was predictably pilloried by environmental groups. Across many policy areas, including the environment, courts since the 1960s have played a major role in the administrative process. Those dissatisfied with an agency ruling found that they could flee to the courts for a second opinion. Critics argue that judges should not second-guess the decisions of agencies and that the process of litigation greatly hinders administrative regulation. The struggle to discourage litigation has primarily been carried out in the courts, where the U.S. Supreme Court's decision in the 1984 Chevron case was seen as a signal to lower courts to grant more discretion to agencies. Whether the courts have taken the hint or the Supreme Court itself has become more deferential to agencies is unclear. One seemingly straightforward way to discourage litigation is to eliminate programs that fund lawsuits. Yet antilitigationists have been largely unsuccessful in this effort. For example, attempts to rid citizen lawsuits of attorney fee provisions have gotten nowhere. Funding for legal aid, however, was slashed after the "Republican Revolution" of 1994 and subjected to various restrictions. Perhaps the most obscure discouragement struggles occur over efforts to reform civil procedure. In fact, despite its musty image, federal civil procedure has in recent years been a quite contentious realm, with particularly heated debate over class action lawsuits. The animating principle of procedural reform in recent years has been to speed up processing of cases by limiting litigation. Reforms regarding class actions, frivolous cases, and discovery have all attempted to reduce litigation. Many of these reforms have, however, met with opposition, and some have been significantly modified en route to enactment, often because of opposition within the bar. Lawsuits over coffee burns, playground injuries, even bad teaching: litigation "horror stories" create the impression that Americans are greedy, quarrelsome, and sue-happy. The truth, as this book makes clear, is quite different. What Thomas Burke describes in Lawyers, Lawsuits, and Legal Rights is a nation not of litigious citizens, but of litigious policies—laws that promote the use of litigation in resolving disputes and implementing public policies. This book is a cogent account of how such policies have come to shape public life and everyday practices in the United States. As litigious policies have proliferated, so have struggles to limit litigation—and these struggles offer insight into the nation's court-centered public policy style. Burke focuses on three cases: the effort to block the Americans with Disabilities Act; an attempt to reduce accident litigation by creating a no-fault auto insurance system in California; and the enactment of the Vaccine Injury Compensation Act. These cases suggest that litigious policies are deeply rooted in the American constitutional tradition. Burke shows how the diffuse, divided structure of American government, together with the anti-statist ethos of American political culture, creates incentives for political actors to use the courts to address their concerns. The first clear and comprehensive account of the national politics of litigation, his work provides a new way to understand and address the "litigiousness" of American society. Thomas F. Burke is Assistant Professor at Wellesley College and Research Fellow with the Robert Wood Johnson Foundation Scholars in Health Policy Program at the University of California, Berkeley.